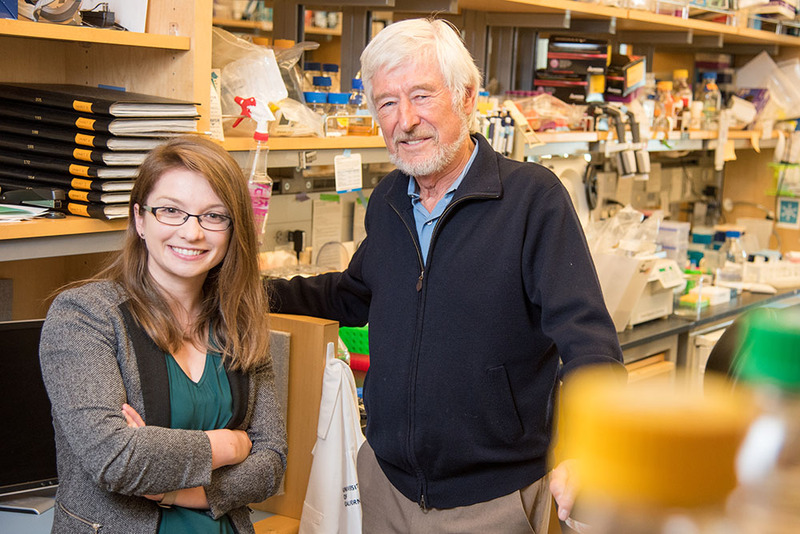 Ioana Aanei (left) and Regis Kelly (right) at the QB3 incubator at the UCSF Mission Bay campus. Pop-up restaurants have proven to be a quick, low-cost way to test a new concept, but what happens when you apply that same nimble model to medical research? That’s the concept behind UC’s new foray into “pop-up institutes,” fast, cost-effective ways to bring people together to tackle a particular problem, without the cost and timetable of building a brick-and-mortar institution. The idea is the brainchild of Regis Kelly, director of the University of California’s QB3 institute, a hub for innovation and entrepreneurship in the life sciences. He realized that scientists need a faster, cheaper option for targeted research projects. The typical university institute can take years to get off the ground, and require a deep-pocket donor who can help underwrite the cost of a new building and the hiring of faculty and researchers. Much like pop-up stores and restaurants, pop-up institutes are designed to be set up quickly at a lower cost and address a specific theme for a period of time — and then be disbanded just as quickly when the purpose has been achieved. There’s no need to wait multiple years for a building or to attract mega-donors. QB3, which has locations at UCSF, UC Berkeley and UC Santa Cruz, launched the first of these pop-up institutes in 2015 in partnership with the Alphabet company Calico to study longevity and aging-related diseases. Now Kelly and QB3’s scientific analyst Ioana Aanei are setting up a new pop-up institute to study fibrosis, a suite of related disorders including idiopathic pulmonary fibrosis, liver cirrhosis, kidney and heart disease. According to some estimates, fibrotic diseases are responsible for around 45 percent of all deaths in the United States, and yet fibrosis is hardly an everyday word. Fibrosis checks all the boxes of what QB3 is looking for when assessing candidates for a pop-up institute: It lacks a dedicated institute, addresses a major public need and has the potential to quickly expand upon our existing knowledge. Under the traditional institute model, costs for getting off the ground can run in the hundreds of millions of dollars, and take years to build facilities and recruit faculty and students. By comparison, a pop-up institute can get started for less than $1 million a year and in a fraction of the time. The smaller startup cost for pop-ups means that the door is open for a wider range of potential donors and partners, including patient advocacy groups, foundations and individuals — groups that are normally shut out of founding traditional large-scale institutes. Kelly likes to compare the pop-up concept to an electronics breadboard, a platform used to quickly and cheaply prototype electronics. The components are the individual laboratories at one of the QB3 universities or a partner organization, and the wires are the postdocs and grad students. For the pop-up fibrosis institute, QB3 is initially funding four students in four different labs, and hopes to expand as the project progresses. QB3’s role is to be the organizer and the matchmaker, finding a group of people with relevant skills and bringing them together to attack a new problem. “Integrating information to solve large problems — it’s something universities are uniquely positioned to do,” said Kelly. Working in a pop-up institute can give postdocs a leg up in a competitive job market by training them in a specialty that is both distinct from that of their faculty advisor and in high demand. Pop-up institutes are not going to replace the large institute model anytime soon, says Kelly. If you are interested in finding out how you can get involved with QB3’s pop-up institutes, contact ioana.aanei@ucsf.edu.